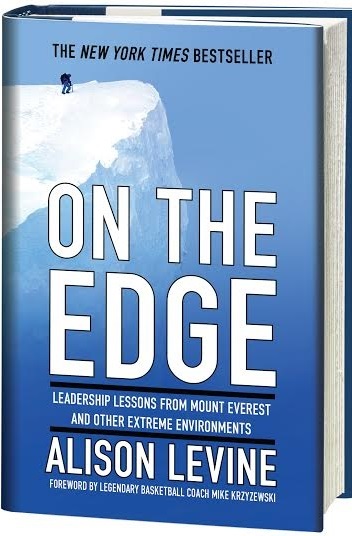 Allison Levine: New York Times Best Selling Author, "On the Edge: Leadership Lessons From Mount Everest and Other Extreme Environments"
Alison Levine is a history-making polar explorer and mountaineer. She served as team captain of the first American Women’s Everest Expedition, climbed the highest peak on each continent and skied to both the North and South Poles—a feat known as the Adventure Grand Slam, which fewer than forty people in the world have achieved. In January 2008, she made history as the first American to complete a 600-mile traverse from west Antarctica to the South Pole following the route of legendary explorer Reinhold Messner. Levine completed this arduous journey on skis while hauling 150 pounds of her gear and supplies in a sled harnessed to her waist. Her success in extreme environments is noteworthy given she has had three heart surgeries and suffers from Raynaud’s disease, which causes the arteries that feed her fingers and toes to collapse in cold weather—leaving her at extreme risk for frostbite. In addition to having tackled some of the most challenging environments in the outdoors, Levine has also spent more than two decades climbing the corporate ladder. She worked in the pharmaceutical and medical device industry, earned an MBA from Duke University, and spent three years working for Goldman Sachs. She left Goldman in 2003 to serve as deputy finance director for Arnold Schwarzenegger in his successful bid to become Governor of California. In 2005, Levine founded the Climb High Foundation, a nonprofit organization dedicated to improving the lives of jobless women in Africa by training them to be trekking guides and porters in their local mountains so that they would have the skills to earn a sustainable living wage through climbing-related tourism. Her work in Uganda enabled the first group of local women to make history when they climbed Uganda’s highest peak—Mt Stanley, in the Rwenzori Mountains. Her work in Uganda is the subject of the PBS documentary Living Courageously. Levine served as an adjunct instructor at the United States Military Academy at West Point in the Department of Behavioral Sciences and Leadership and is a strategic advisor for the Thayer Leader Development Group at West Point, an executive education a program that shares West Point leadership best practices with senior level-executives from the public and private sectors. She was a contributing author to the book Leadership in Dangerous Situations: A Handbook for the Armed Forces, Emergency Services and First Responders (Naval Institute Press). She also serves on the board of the Coach K Center on Leadership & Ethics at Duke University. A sought-after consultant and keynote speaker on the subject of leadership development, Levine has addressed audiences ranging from Fortune 500 companies to professional sports teams to the prestigious World Economic Forum at Davos. She was featured on the CNBC program “The Future of Leadership,” alongside other notable leaders such as Gen. (Ret.) Wesley Clark, former NATO Supreme Allied Commander; Henry Paulson, former Treasury secretary; and Robert Kraft, CEO and chairman of the New England Patriots. Levine is the author of the New York Times best-seller On the Edge: Leadership Lessons From Mount Everest and Other Extreme Environments. Having spent prolonged periods of time in some of the world's most dangerous and inhospitable places, she tackles the topics of creating cohesive teams, taking responsible risks and developing no-nonsense leaders that can succeed in times of uncertainty. I make people think and I make people laugh. I do this for a living through my keynote speeches and my writing (my first book On the Edge came out last year and is now a New York Times bestseller). I speak at more than 100 conferences a year and share the lessons I learned climbing the Seven Summits and skiing to both the North and South Poles. As an avid mountaineer and polar explorer, I spend a lot of time in remote, extreme environments, so of course the anecdotes I share involve a lot of scary moments, suffering and disappointment...but I figure there is already enough drama in the world, so I like to keep things light in my speeches and in my writing. My favorite book review for On The Edge described it as, "All the intrigue of Into Thin Air, but without the depression." I figure if my material can get people to both think a little and laugh a little, then it's a day well-spent. I know that I will never be the fastest, strongest climber on the mountain, but I am absolutely relentless about putting one foot in front of the other, and that's what gets me to the top. By never forgetting that there are always going to be more mountains to climb, so no matter how well I perform on any given day -- the next day I need to be even better. Personal: Be the best partner to Pat, the best Godmother to my Godkids and the best friend and teammate that anyone could ask for. I strive for this every day. Business: Inspire more people to get out of their comfort zones. Continue my work with jobless women in Africa (I started a nonprofit that trains women to work as porters and trekking guides in the Rwenzori Mountains which border Uganda and the Democratic Republic of Congo), learn to embrace social media (because I know it is important for branding, but right now I still hate it and find it annoying). I also recently met a woman who is making a documentary about the first Nepalese woman to summit Mt Everest, and I am partnering with her to help her get funding to finish the film.